We're back in one of our favorite places this week for the first ever J/70 North American's which is being hosted by the Annapolis Yacht Club! Although we decided not to bring the Sail22 Support Trailer to the event due to space limitations (there are 90 boats here!!! ), but we have brought all of the parts you may need. We are fully stocked with covers, upgrades and spare J/70 parts (mast, boom, stanchions, mast plates, etc) as the J/Boats Mobile Resource Center. 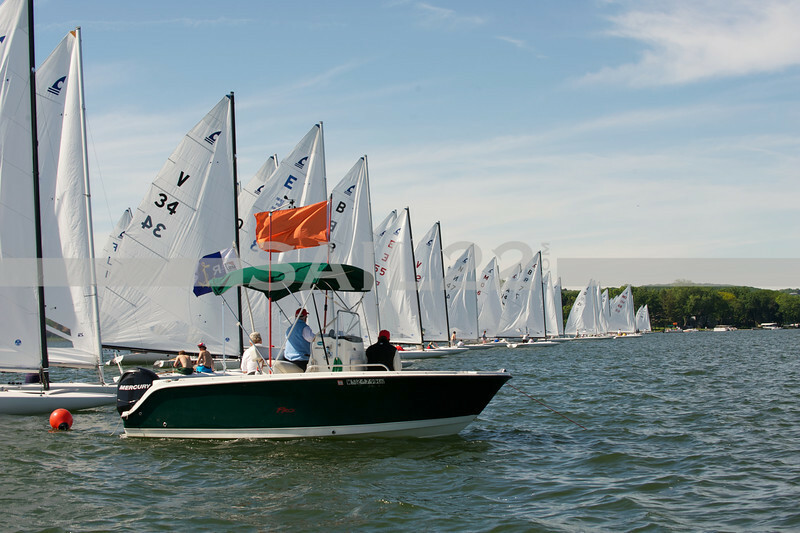 This past weekend we headed up to C Scow Nationals 2013 in Pewaukee, Wisconsin hosted by the Pewaukee Yacht Club. Friday and Saturday were two days of light air racing with three races completed and today saw much nicer breeze and three more races. Congratulations to Leif & Erik Evensen & Jackie Eisenhauer, 2013 C Scow National Champions!!! Becky was out on the water with her camera and captured images of today's racing. Check out the 2013 C Scow Nationals Gallery here with more images to be added. For a simple detailed price list of all of our offerings for parts and logistics including new items not pictured below, please go to our J/70 Options & Upgrades Price List. 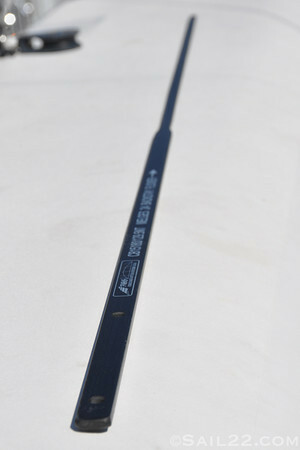 Ronstan Winch Handle Pocket $34 Ask about other J/70 covers & bags we are working on. J/70 Mast Bunk - $700 - Low position for travel and high position for rigging and stepping. 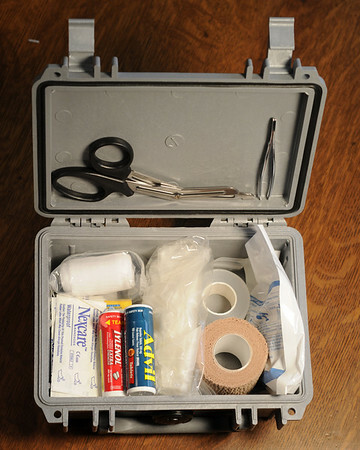 A much safer and easier way to rig and travel with your J/70. 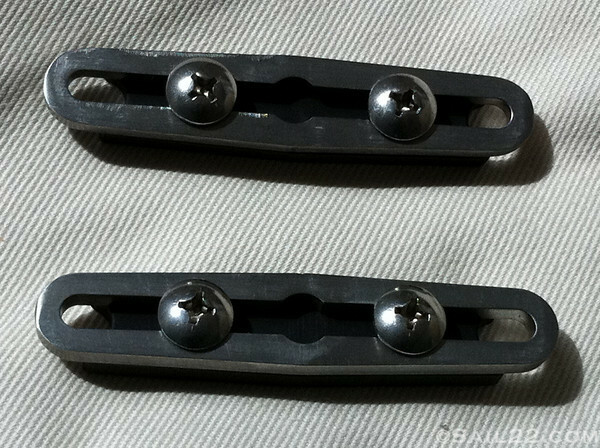 Keel Crane Bracket Kit $100 - Secure your keel crane to the trailer for travel outside the boat. J/70 Third Hands with Keepers - $100 pair - Allows you to tune your rig without pulling out tools. Locks the top of the rigging wires. 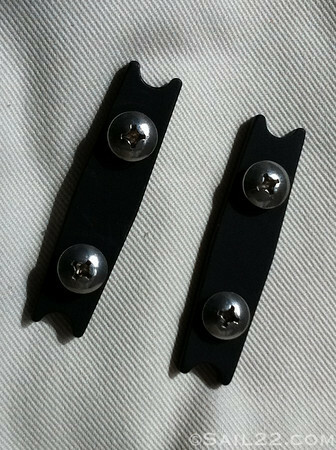 J/70 Shroud Locks - $40 - These little guys go between your open body turnbuckles to keep them from spinning. Sail22 Rig Tuning Tool - $40 - Keeps your turnbuckles from being beat up. Keep this in your PFD for quick rig tuning. 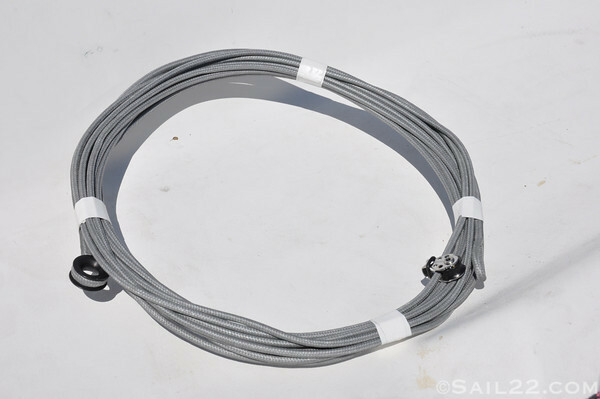 Sail22 Full Service Rigging - Ask about custom rigging to make your J/70 easier to sail, rig and de-rig. together which can be looped through the clew of the sail. Easy to hook up and replace if you blow one up on the water. 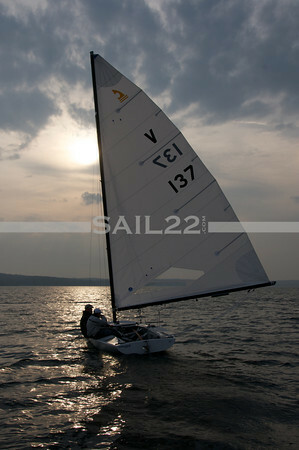 The Sail22 J/70 Soft Deck Kit $750. Soft non-absorbent high density foam kit provides traction to the deck instead of traditional non-skid. Easier on lines, gear and people! Dock Boxes / Trailer Boxes - $700 - Available in Grey, White and Beige. Ask about custom graphics for your dock box! Mounting brackets to attach any dock box to your J/70 Trailer ($180 per set/box). 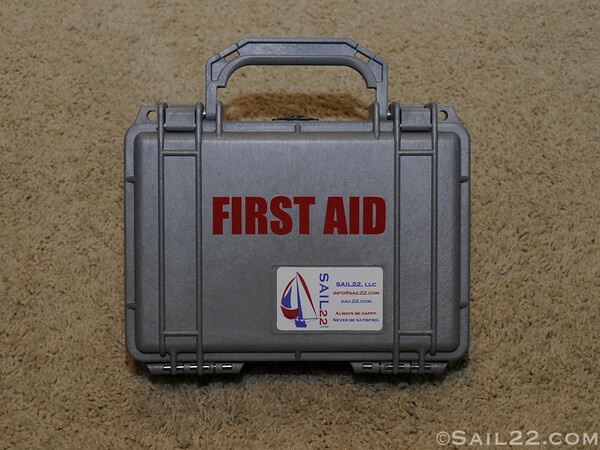 The Sail22 Harken Soft Dock Box. While working with Harken to design the covers for the J/70 we created this portable soft dock box with lightweight tent pole structure. Loops on the side to secure to the dock and a top flap that zips on the front to keep water from entering. The bottom is also water resistant to help keep your gear dry when it's on the dock. Available in sizes small $300 and large $450. J/70 Lifting Straps (2 needed) - $120/set. No shackles needed. Just loop through and hoist. Since we are working with J/Boats on the brand new J/70, we headed up to Bristol, RI to test sail hull #1 (USA 1) and #2 (USA 2) with the sailmakers and the team from J/Boats. Our verdict....we think you're going to love the J/70!!! It's everything and more with J/Boats true attention to details in all aspects of the boat. CCF has built another solid member to the J/Boat family. 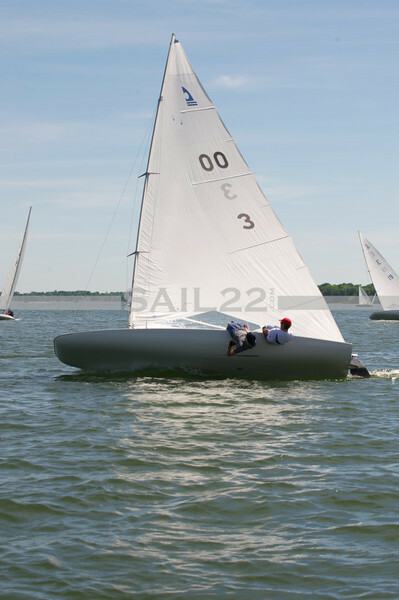 A boat will be headed to Charleston Race Week for demo sails, so let us know if you're interested. We'll be happy to help arrange a chance to try it out if it is possible. We have USA 14 on order as part of our work with Stearns Boating from Chicago to bring the J/70 to the Midwest. We'll be arranging demo sails at various locations throughout the summer and the boat will be based at Sail22 Headquarters in Culver, Indiana. If you'd like to take USA 14 out for a test sail this summer, please send us an email to info@sail22.com or feel free to give us a call. We'd love to hear from you! For more information on the latest J/70 news, make sure to visit the J/70 website. We are already working to put together upgrades for the J/70, including our Sail22 J/70 Soft Deck Kit and upgraded Sail22 Race Rigging options! Sailing World's video features a Sail22 cameo, as we sailed USA 2 with Jeff Johnstone, while Sailing World's Dave Reed and Meredith Powlison were on USA 1 with Kerry Klingler of Quantum Sails. 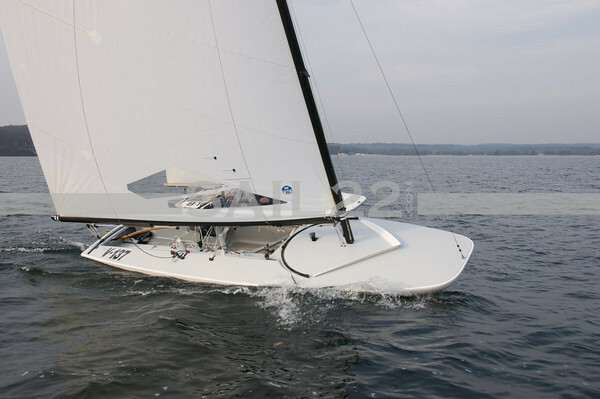 Dave's Sailing World review of the J/70 can be found here. Sail Magazine's team also did a demo sail while we were there. They had big smiles in the big breeze. Read Adam Cort's J/70 article here. The reviews speak well of this spirited family boat! Stu Johnstone put together another video showing off a little more fun with the J/70's. Definitely shows off how balanced and responsive these little boats are in some breeze! Becky spent some time photographing the J/70's in and out of the water. Enjoy! Lots of entries for the Sail22 Grab Bag Giveaway!!! We'll have to do this again soon! Thank you everyone for spreading the word and participating in the giveaway. We made up a few extra grab bags, so if you're at Bacardi Miami Sailing Week or know someone who is, tell them to stop by the Sail22 Support Trailer and pick one up. We'll give them out until they are gone! If you're a winner, please contact us in the next 48 hours (ie. by Saturday at noon) at info@sail22.com. 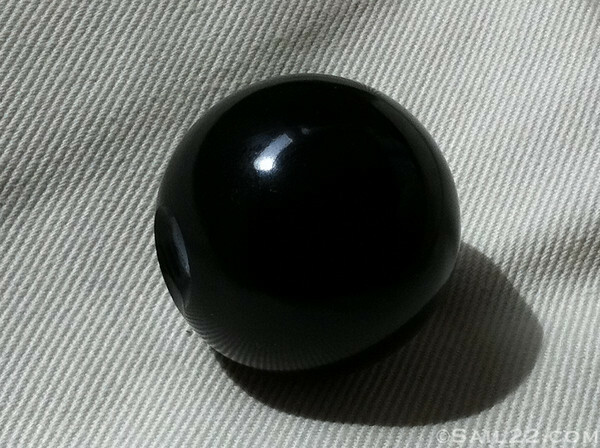 Please send us your full name, address and phone # for shipping within the United States. If we'll be seeing you here at Bacardi, Etchells Nationals or Charleston Race Week, please just let us know and we'll hold it for you to pick-up. If you do not contact us within 48 hours, we'll be drawing a new winner. Remember, we're trying to clean out the Sail22 Support Trailer, so we want to ship out everything as soon as possible! To make finding Melges 32 Gold Cup 2011 Team Galleries easier, here are the links to each of the different teams. Great conditions as always in Fort Lauderdale and huge thanks to Vicki and Steve Rhyne and the Mojo team for allowing us to get out on the water! Congratulations to Steve Howe and the Warpath team on their win and a very impressive regatta. Check out the Sick Trix gallery for one of the best Melges 32 wipeouts we've seen in a very long time. 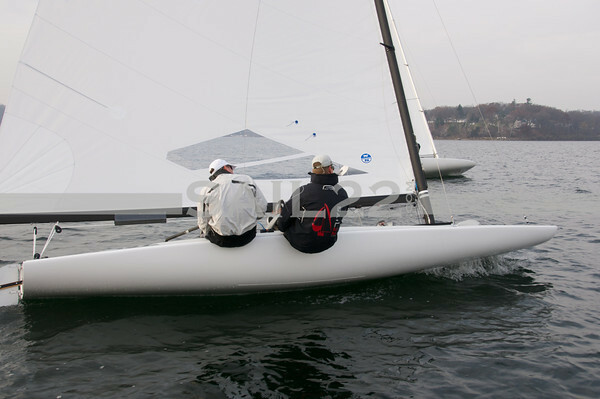 For more coverage from the event, go to Sailing Updates to see our on the water mark rounding details and blog coverage. Enjoy! Sail22 is excited to announce a new affiliation with J/Boats to further support all of our clients who own J/Boats. Sail22 has been supporting racing teams since 2007 with the Sail22 Support Trailer. 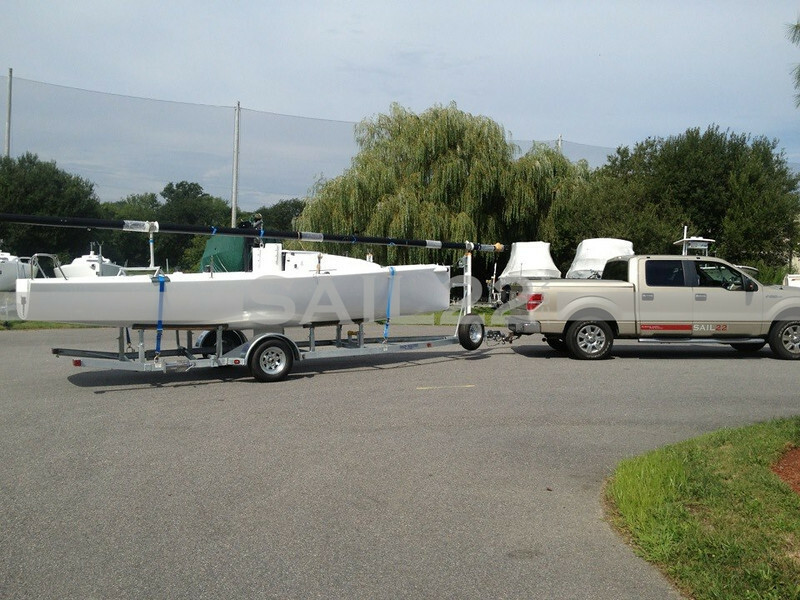 The trailer is fully stocked with rigging, cordage from New England Ropes, Ronstan and Harken parts, custom designed parts, gear and accessories from Gill, as well as, tools for teams to use at regattas. Sail22 is also working with J/Boats Dealer, Stearns Boating, to support J/Boats owners and teams in the Midwest region for service needs, rigging and gear. As the J/Boats Mobile Resource Team, Ed and Becky Furry have over 25 years of combined racing on J Boats and will work with teams on a one-on-one basis for their needs. Look for the Sail22 Support Trailer this winter season in Key West, Miami and Fort Lauderdale. The trailer will be stocked with all of your J/Boats needs to make your boat faster and provide service for any repairs or rigging. A video tour of the Sail22 Support Trailer will give you a even better idea of what you can expect to see at upcoming regattas. For the J/Fest Winter Series, the Sail22 J/Boats Mobile Resource Team will be located in Truman Annex and will be available starting the week before Quantum Key West Race Week 2012. Until Key West and after, the the trailer will be based at Shake-a-Leg Miami and will head to Fort Lauderdale for both of the Winter Series events, J/Fest Dead President's Regatta and the J/Fest Super Lucky Regatta at the Bahia Mar. To cap off the end of the winter season, the J/Boats Mobile Resource Team will be in Charleston for Charleston Race Week 2012. Feel free to contact Sail22 with any of your J/Boats Resource Team questions or needs at info@sail22.com or 574-889-0022. Sail22 is proud to be part of the J/Boats family and looks forward to meeting and working with more J/Boat sailors. The Sail22 Support Trailer was in need of a little bit of a face lift recently, so we decided it was time to go for a full trailer wrap. We sorted through the Sail22 Photography photo galleries and came up with one photo of each of the different classes we work with on a regular basis to grace the sides of the trailer. Our friends, Cary and Beth at GT3 Creative recently purchased a large format printer capable of printing on wrap material, so it seemed like a no brainer for us. They do awesome design work and we use them for our web designs, logos, etc and highly recommend them. Tell them you heard it from Sail22! ;) We sent them our design and they printed and flew the wrap out with them to Culver, Indiana. They arrived at Sail22 Headquarters late Thursday evening and started on the wrap early Friday morning. We had pulled the Sail22 Support Trailer into the Speed Barn, so they had a climate controlled area to work in. The wrap looked great from the start. We posted several of the "in process" photos on our Sail22 Facebook page if you didn't see them. Make sure you "like" our page while you're there to see our regular updates that do not make it onto the blog. We update it frequently! Here's the official reveal! We couldn't be more excited about how it turned out and can't wait to show it off when we head south for the winter regatta circuit. Leave us a comment and let us know what you think! Chris Chadwick owner of the J80 Church Key sent us a guest post about last weekend's J80 East Coast Championship in Annapolis, Maryland. Ed and I had so much fun sailing on Church Key and it's always sweeter to win when you sail with friends. It was also a nice change to not be photographing the regatta and sailing instead! Check out Sara Proctor's SailFastPhoto images for some great shots from the weekend. Well, back to Church Key…As I said, she’s not the prettiest girl at the dance, but she gets the jobdone (sort of like a German Sausage maker…) and she is very loved by her family. called wind, boats and generally attempted to keep me at least moderately in check during an incredibly shifty regatta. The forecast for the weekend was sketchy. Friday would be chilly, with a nice breeze from the Northeast that would slowly diminish. Saturday we were to be besieged by an early winter Nor’easter…and then Sunday was just cold, with even shiftier conditions from the Northwest. The first day of sailing was intense. Church Key scrambled to make the first race after a last minute outhaul fix on the way out. Firebolt, owned by Bill Hunt, sailed a great first day. Through four races they ended the day in first with 11 points. Will Crump, sailing on Jeff’s Boat and our crew on Church Key were right on Firebolt’s heels in a tie for second (Will was winning the tie breaker with two bullets) at 13 points. John White was 5 points back sitting in 4th. At the end of the day, we took a good look at the impending storm and made the smart decision to postpone sailing forSaturday. Seeing the weather that hit, this was an incredibly smart call!! The last day of sailing started with freezing temperatures and shifty winds. We got out to the race course and commenced race one of the day. Our team talked prior to the start and decided we were going to sail our own race and stay clear of everyone at the start. We went for the boat end at the start and were given the opportunity to push Will Crump over the line. This wasn't the plan, but it didn't hurt us either. Though not our greatest race, we scored a 5, better than the 2 boats in front of us going into the day. Suddenly we were sitting with two points in first and John White had moved into the second position. The second race we were launched. Ed and Becky kept us in the wind and Tom did a great job on the jib to keep us driving through increasingly shifty conditions. By the end of the second leg, we had a nice lead and played cover for the remainder of the race. The 3rd race continued with our goal of consistency. The wheels stayed on and we were able to work the shifts nicely. We finished with a 2nd. At this point the wind had shifted drastically and the current was strong. The Race Committee attempted to shift the course and get one last race off. They finally were able to start a fourth race, but the shifts were so drastic that the committee decided to abandon the race and call it a day. We had won the regatta with a solid 10 point lead!!! See you on the water soon!!! The Sail22 Speed Barn is now fully winterized with spray foam Icynene insulation thanks to Eco-Comfort which will now allow us to work on sailboats in our facility throughout the winter in a warm environment! Winters in the Culver, Indiana area are a bit chilly and last year, we toughed it out without insulation, but it was cold! We spent a lot of time doing our research on types of insulation, cost, R-value, thickness, environmental and health factors. We decided that spray foam was the way to go and interviewed several different companies. We chose Randy and his team at Eco-Comfort in the end and feel we couldn't have chosen anyone better to do our project. Randy is extremely knowledgeable about the types of insulation available on the market and Icynene was the best product we could find, as well as being at a reasonable cost. It's the only insulation type used by the American Lung Association and sprayed using a water base, with no harsh chemicals. Definitely an important factor when you're considering having it in your home or business for many, many, many years! Randy and his team came by on Thursday and they went to work. The guys did an excellent job covering with plastic anything that wouldn't be sprayed. As an added bonus, we also had them insulate our garage roof deck and our basement stone foundation along the perimeter. They worked quickly and managed to cover and spray both of these areas, as well as completely cover the Sail22 Speed Barn for insulation on Friday. They even left our basement cleaner than when they started! Thanks guys! We had the team spray the roof deck and walls of the barn on Friday and they did a great job. The spray insulation is pretty amazing stuff. It's sprayed, hardens in about 15 seconds and only spreads through the path of least resistance and stops, so it doesn't damage a structure. And the smells during and after they spray is minimal, tolerable and dissipates quickly. Super clean, super insulated and ready for the winter! We couldn't be happier with our experience working with Eco-Comfort and are planning to have them back in a few weeks to insulate the old barn Ed's dad has been renovating to become his workshop space and Becky's new Always Happy Life Photography studio! The Canadian Team Vincere, of the Royal Canadian Yacht Club, skippered by Oskar Johaneson leads the United States team from Macatawa Bay Yacht Club's Team Heritage, skippered by Bob Hughes in the second day of racing at the 2011 Canada's Cup being sailed in Holland, Michigan by three races to two races. Sail22's Sailing Updates is providing live blog coverage of the 2011 Canada's Cup with short video clips of the racing uploaded from the water. After waiting for weather to pass in the morning, the teams raced two races in the afternoon, with both teams earning a victory. Photo gallery by Becky Furry with racing from today is now available on Sail22 Photography and will continue to be added to throughout the event. Racing will continue tomorrow with the winner of the Canada's Cup 2011 being determined by 7pm on Sunday evening. The Canadian Team Vincere, of the Royal Canadian Yacht Club, skippered by Oskar Johaneson leads the United States team from Macatawa Bay Yacht Club's Team Heritage, skippered by Bob Hughes in the first day of racing at the 2011 Canada's Cup being sailed in Holland, Michigan. Sail22's Sailing Updates is providing live blog coverage of the 2011 Canada's Cup with short video clips of the racing uploaded from the water. After day one of racing having "hurry up and wait" conditions leading to no racing, the teams headed out early with the possibility of four races on Friday. Team Heritage came out strong, winning the first race in the series, however, the Canadians quickly showed they came to put up a good fight and swept the last two races of the day. Team Heritage was able to play a left shift in the first race to lengthen the gap between the teams, but the right side of the course was where the most action was for the second and third races and Team Vincere did a great job of protecting it. The teams decided to not continue with racing after the three races and will resume the Canada's Cup 2011 Finals series on Saturday. Photo gallery by Becky Furry with racing from today is now available on Sail22 Photography and will continue to be added to throughout the event.